We present results from the first large parameter study of neutron star mergers using fully general relativistic simulations with finite-temperature microphysical equations of state and neutrino cooling. We consider equal and unequal-mass binaries drawn from the galactic population and simulate each binary with three different equations of state. Our focus is on the emission of energy and angular momentum in gravitational waves in the postmerger phase. We find that the emitted gravitational-wave energy in the first ~10 ms of the life of the resulting hypermassive neutron star (HMNS) is about twice the energy emitted over the entire inspiral history of the binary. The total radiated energy per binary mass is comparable to or larger than that of nonspinning black hole inspiral-mergers. About 0.8-2.5% of the binary mass-energy is emitted at kHz frequencies in the early HMNS evolution. We find a clear dependence of the postmerger gravitational wave emission on binary configuration and equation of state and show that it can be encoded as a broad function of the binary tidal coupling constant kappa_2^T. Our results also demonstrate that the dimensionless spin of black holes resulting from subsequent HMNS collapse are limited to <= 0.7 - 0.8 . This may significantly impact the neutrino pair annihilation mechanism for powering short gamma-ray bursts (sGRB). Top: evolution of the maximum rest-mass density for all simulated configurations. For simulations times t < t0, rho_max is the maximum value of the densest star; after contact and merger rho_max is the absolute maximum. Bottom: color coded temperatures and density at three representative times for LS220-135135. The black contours enclose densities larger than 10,20,40,80 and 98% of rho_max. The core of the HMNS remains relatively cold, with T ~= 10 MeV and is surrounded by a hot shell T ~= 40 MeV of material at densities ∼5 x 10^14 g/cm^3. BNS dynamics in terms of gauge-invariant binding energy vs. angular momnetum curves. Equal-mass configurations are compared to the corresponding nonspinning BH binary. 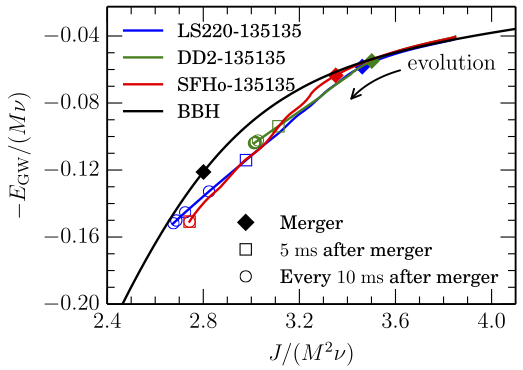 The largest GW luminosity comes from the HMNS, and the overall energy emission (relative to the mass) from BNS is in many cases larger than the BH inspiral-merger case (excluding ringdown). These features are common to all our simulated BNS systems. 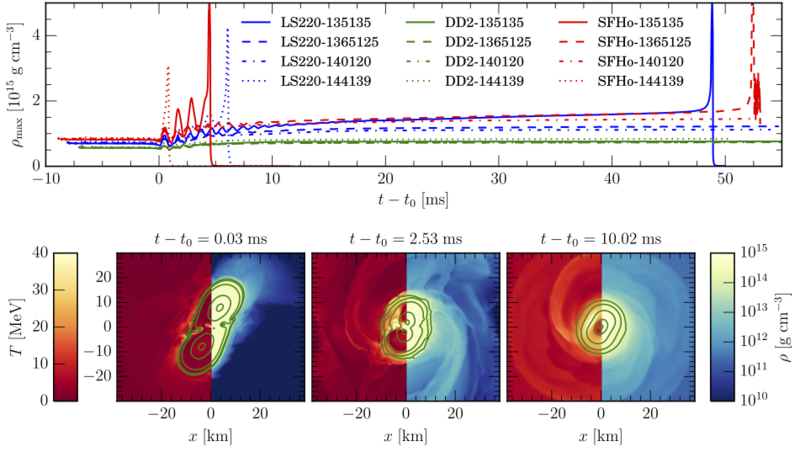 We provide gravitational waveforms from our simulations hosted by zenodo.org at the following URL: https://zenodo.org/record/57844. The data are citable with . They are licensed under the Creative Commons CCZero license. When using the data, please also cite Bernuzzi et al., Phys. Rev. D, 94, 024023 (2016).